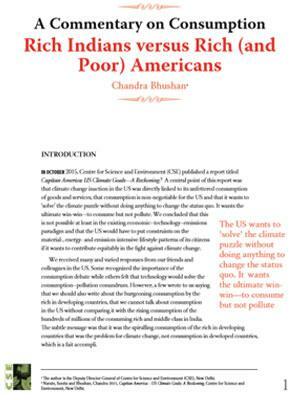 IN OCTOBER 2015, Centre for Science and Environment (CSE) published a report titled Capitan America: US Climate Goals-A Reckoning.2 A central point of this report was that climate change inaction in the US was directly linked to its unfettered consumption of goods and services, that consumption is non-negotiable for the US and that it wants to ‘solve’ the climate puzzle without doing anything to change the status quo. It wants the ultimate win-win-to consume but not pollute. We concluded that this is not possible at least in the existing economic–technology–emissions paradigm and that the US would have to put constraints on the material-, energy- and emission-intensive lifestyle patterns of its citizens if it wants to contribute equitably in the fight against climate change. We received many and varied responses from our friends and colleagues in the US. Some recognized the importance of the consumption debate while others felt that technology would solve the consumption–pollution conundrum. However, a few wrote to us saying that we should also write about the burgeoning consumption by the rich in developing countries, that we cannot talk about consumption in the US without comparing it with the rising consumption of the hundreds of millions of the consuming rich and middle class in India. The subtle message was that it was the spiralling consumption of the rich in developing countries that was the problem for climate change, not consumption in developed countries, which is a fait accompli.